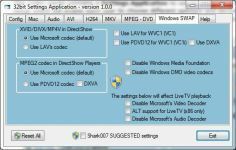 ADVANCED Codecs for Windows 7 eliminates the necessity to find the correct video and audio codecs for playing video and audio files in Windows 7. ADVANCED Codecs for Windows 7 is a pack of audio codecs for instalation for use with Windows 7. It allows to play videos with most media players. User can change the installation options by choosing the codecs to be installed. This package offers a variety of codecs with support for video and audio extensions avi, amr, mpc, ofr, divx, mka, ape, flac, evo, flv, m4b, mkv, ogg, ogv, ogm, rmvb, xvid. X64-based versions of operating system are also supported. This software is a free pack to ensure the transition to Windows 7 without headaches.